You only have one set of adult teeth. You can't make more if you damage the ones you have. That's why it's important to take good care of them. Grinding your teeth at night can gradually wear down the enamel on your teeth. Plus, it can cause headaches and contributes to jaw problems like TMJ. What's surprising is many tooth grinders aren't even aware they grind their teeth! 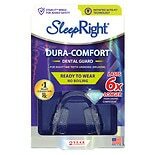 Fortunately, there's a way to protect your pearly whites as you sleep - by wearing a dental mouth guard. 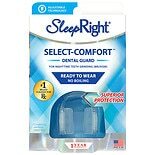 A mouth guard covers your teeth, cushioning them against grinding or biting as you sleep. 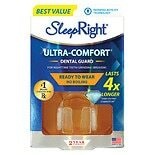 Just slip one on at bedtime for all-night protection. For maximal comfort, choose a mouth guard that closely conforms to the shape of your mouth. 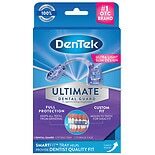 With today's self-adjusting dental guards, you can get the benefits of a custom-made mouth guard like a dentist would make without the added cost. 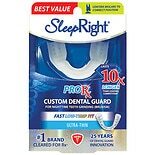 You'll sleep easier knowing your teeth are shielded against damage as you dream. All you have to do is wear it! 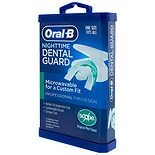 Dental mouth guards are strong, durable and easy to clean using a toothbrush, toothpaste and water. It's natural to be concerned about what you put in your mouth. You want reassurance that what you're using is non-toxic. Manufacturers of dental mouth guards have responded to these concerns by developing mouth guards free of phthalates, BPA and silicone. Allergies to latex? Latex-free dental mouth guards are available that are safe even if you're sensitive to latex. Best of all, you can choose from dental mouth guards that don't require boiling in hot water or heating to mold the plastic to a comfortable fit. Instead, the bite pads swivel to meet the contours of your mouth. Once you bite down, the heat of your mouth further shapes the guard to conform comfortably your bite. These self-adjustable dental mouth guards are appropriate for all mouth sizes and you can wear one even if you have braces. Plus, dental mouth guards are made with tough materials that make them durable. Just store it in the convenient storage case that comes with it for safe keeping. 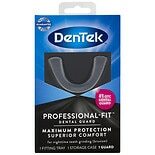 Protecting your teeth is important and wearing a dental mouth guard gives you that protection.